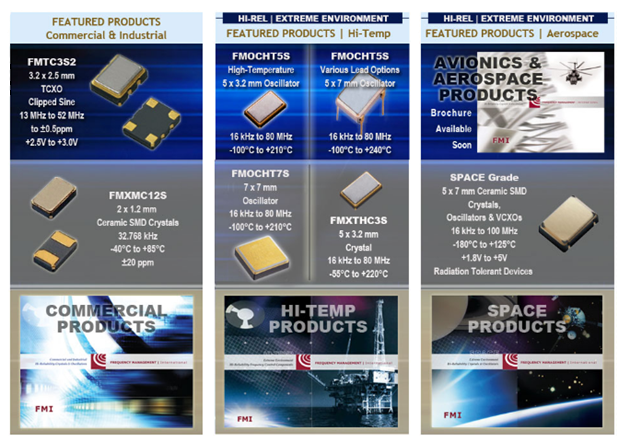 FMI supplies products to a variety of market segments including; computer peripherals, industrial instrumentation, oil drilling, geothermal, commercial space, LAN/WAN, optical networks, process controls, telecommunications and wireless products. FMI offers high-reliability Quartz Crystals and Clock Oscillators to VCTCXOs and Phase Locked Sources. Our products are offered in both traditional through-hole packages and Surface Mount (SMD) Packages including the smallest of the small.